Uh, Burbank. We haven’t been here in a while. I think TiTim and I rode here early last year or maybe it was 2 seasons ago, late in the year. Been a while in any case. Here’s a review on it. They have some nice, well-maintain sections out there but it is always difficult to put together a complete loop. It seems we are going out one trail and then backtracking or going out one trail and then it loops back on itself quickly. Maybe that’s why we don’t go there much. Too frustrating. I got a new toy last week! 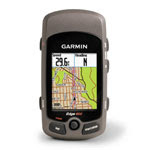 The Garmin Edge 605. This thing is awesome. For those of you that know me, I actually went down-market on this buy. There’s a recession on, right? There is an Edge 705 out there for $100 more but I figured that I didn’t need the heart monitor (useless device…I know my heart is working on these rides, I can feel it) or the Cadence sensor (another useless thing…I have power, I don’t need to be reminded that I do; nor try to calculate it) or the barometric altimeter (how accurate do you need to be on elevation anyway…it’s New England, not the Alps). I used it to mark our course tonight. Here are the details of the ride as uploaded to the Garmin Connect site. I also uploaded the course to Google Earth. Here is the detailed map in PDF format printed from Google Earth. 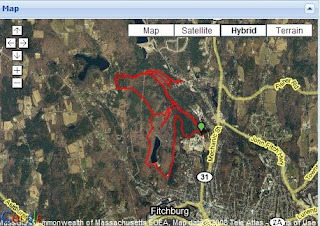 You can get the actual Google Earth KMZ file here so you can open it in GE and take a look at the running elevation data as well as do a “tour” fly through of the ride. Almost like being there…well…maybe not. My legs feel like they did some riding even though a long “loop” was not to be found. You’ll notice from the details that we did 10 miles in 2 hours and averaged 4.8 MPH. I am really not sure if that is good on a mountain bike or not. There were a lot of hills and we did stop often as we usually do to rest and have a scooby snack or two. My highest speed down a hill was about 22 mph. Keep in mind that downhills are not usually smooth. In fact one of those downhills where I reached that speed was quite hellatious. There were a couple of washouts towards the bottom and frankly it was kind of scary! It was probably at a 60-70 degree angle. NICE. We did some parts twice. It’s hard to see on the maps but we came back to the main trail a couple of times and just went out again in another direction. A couple of times we dead-ended and it was usually after a sick downhill which meant that we had to climb back up it….walking of course! I was so jacked about my new toy that I forgot to grab my camera and take the usual pictures of the trail head and post-ride activities. Geo was a no-show. Something about one of his kid’s girlfriend’s graduation in Canada??!! How was it Geo?? No blood tonight but it was fun doing a little exploration. Hamburgers and ventilation for post-ride festivities. Very large cookies for dessert. Some would say we bike for the BBQ and beers after. I would say that is absolutely true. Just think how fat my friends would be if we skipped the ride and went straight for the BBQ. Regardless of exercise, I will always be slim as…. 3 comments to Burbank Hospital…the trail. Please don’t forget that you are talking to the road cyclist who flipped his bike on a covered bridge at 20mph and road the last 15 miles home bleeding from 5 different places with a warped front wheel and then went white water rafting the next day. …but tougher than you road bikers! That is a sweet Garmin! You mountain bikers are slow though.